Over the past 35 years Fleming has performed for AIDS Walks, homeless shelters, food banks, pro choice rallies, bars, coffeehouses and events throughout New England, New York City and beyond. Ellyn's newest cd is titled "Once Upon An Anthill". It was released in July of 2018. In June of 2015 Ellyn released her first fully instrumental cd. titled ECLIPSE. This contemporary and versatile body of work is currently being used for some upcoming independent film soundtracks. It's available for purchase on her website. On November 11, 2014 Ellyn delivered a solo performance for Vietnam Veterans at a ceremony in Portsmouth R.I. to salute the 50th Anniversary of the Vietnam War. In October 2014 she released a brand new cd single in support of nation wide marriage equality titled, "The Proposal". In 2012 she supported the Obama Campaign with a music video made with artist and partner, Paula Visnoski. The video titled "Truth Is" pays tribute to Abraham Lincoln, Martin Luther King Jr., Gloria Steinem, The OWN Network, and Alva Vanderbilt Belmont as they all represent people that have contributed greatly to Americas' fight for equality. When the Twin Towers were bombed in N.Y.C. 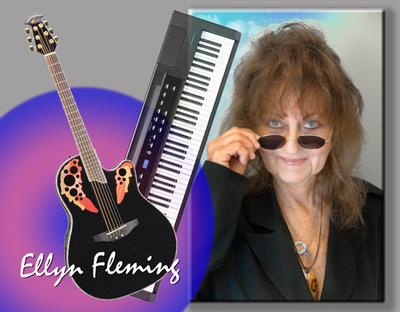 on 9/11, Fleming wrote and recorded a cd single titled "Crying Over New York City". She released it on 9/12 donating all profits to The Red Cross. In 1991 her song titled "30 Something" received national attention in HotWire Magazine with its' message of strength and encouragement for women everywhere to embrace their own inner light. The late 80's through the early 90's saw Ms. Fleming singing for countless Pro Choice rallies as abortion clinics across the United States were being bombed and protested. for democracy, equality, recovery and the underdog. As one reflects on Ellyn Flemings' music over the past 3 decades, it's clear that her creative efforts have been "mission driven". She has worked to inspire social and political reform by using her talents to support freedom and justice for all. Her songs are woven into the many layers of bricks that all represent so many people that have, and continue, to build upon the foundation of all that we are proud to call The United States of America. "An artistic triumph! The material is smart enough to show some hard introspection and honest enough to confront life's dysfunctions with confessional courage"